Medical Xpert Pro has been designed for healthcare professionals in order to help with the medical taking decision process. Medical Xpert Pro can not only take into account patients’ signs and symptoms, but also laboratory test results and search for similar patients in a case database.Those capabilities would allow medical practitioners to accelerate the medical decision process in a reliable and accurate manner. Medical Xpert Pro will help to detect diseases that do not have clear diagnostic tests or symptoms that allow the possibility of making an easy clear information as Autoimmune Diseases (AID). Medical Xpert Pro uses Bayesian analysis calculations for that, and a unic proprietary algorithms (patent pending) to help realize how probable one disease is from the others, and how to deal with a patient that has several diseases at the same time. 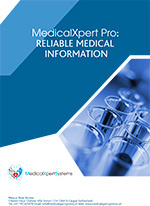 More information on Medical Xpert Pro website. Tailored to your needs, “My Symptom Guide” can find out which disease could be causing your symptoms. Our program can estimate the likelihood of you suffering from, for example, anemia, diabetes, etc. according to the signs. It can also give you detailed health information and guide you to the nearest hospital(s) and doctor(s). Our database is based on reliable articles and medical publications. In addition, it has been approved through notable medical studies. That allows us to give an accurate estimation of what could be the cause of your symptoms. We also have a database with detailed information on the function, causes, and how to treat the most common conditions such as diabetes, anemia or fever. Medical Xpert pro and My Symptom Guide are expert system that use artificial Intelligence. The Experienced Database Module can find previously treated patients with the same symptoms that you have so our software is constantly updated with patients’ cases (experience). The software is based on multivariable differential mathematics and a unique set of patented algorithms, with reliability and accuracy, scientifically tested by reputable medical institutions. Medical Xpert Pro and My Symptom Guide are offered through an internet web-portal in a private cloud in Switzerland: this ensures a high level of data protection. In addition, Medical Xpert Systems philosophy of providing fast and flexible assistance to improve medical healthcare guarantees excellent customer service. 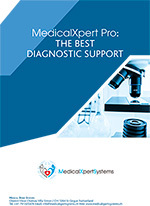 Medical Xpert pro and My Symptom Guide will not, under any circumstances, substitute diagnosis performed by medical professionals, but rather serve to suggest possible illnesses compatible with the patient’s symptoms.